Lights flash, curtains unveil, and fierce individuals emerge from behind a glamorous backdrop, making their way down the runway as the crowd soaks up their style. The BSB “Classic” Fashion Show has arrived. 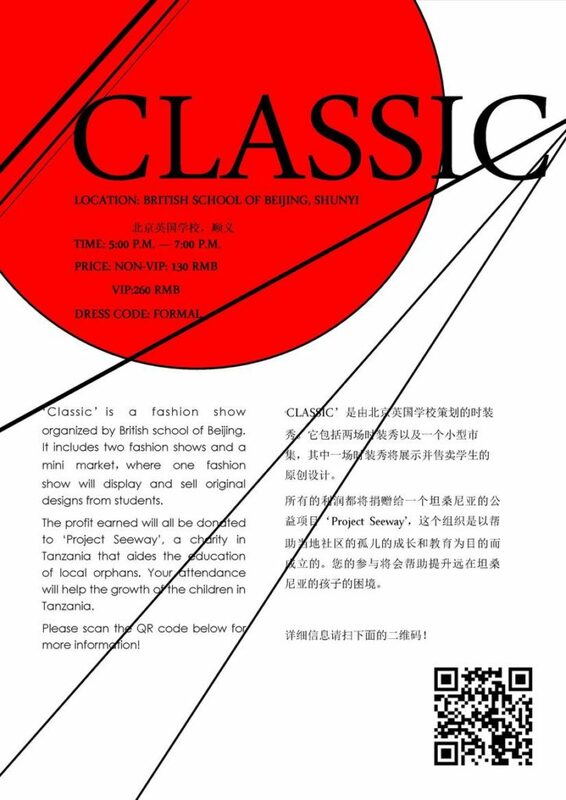 On Sunday, April 23, students in the British School of Beijing, Shunyi’s (BSB, Shunyi’s) International Baccalaureate Diploma Programme will show off their fashion pieces while raising money for Project Seeway, a charity with which BSB, Shunyi students have long collaborated. The entire event will include two fashion shows and a mini-market, where the students’ pieces will be sold. Non-VIP tickets will be RMB 130 and VIP tickets will cost RMB 260. VIP tickets will include access to a wider range of food and drinks, including wine, and a seat closer to the runway. All proceeds will go towards supporting Project Seeway, a charity that aids the education of orphans in Tanzania. BSB, Shunyi has been closely involved with Project Seeway. The charity runs a Children’s Care home for orphaned children as well as a kindergarten school for local Tanzanian children prior to their enrollment into state primary schools. Maizie, a Year 12 student at BSB, Shunyi, is one of the organizers of the show. “The theme is “Classic” and the original fashion show will last for approximately 20 minutes with 30 designs,” Maizie told us. 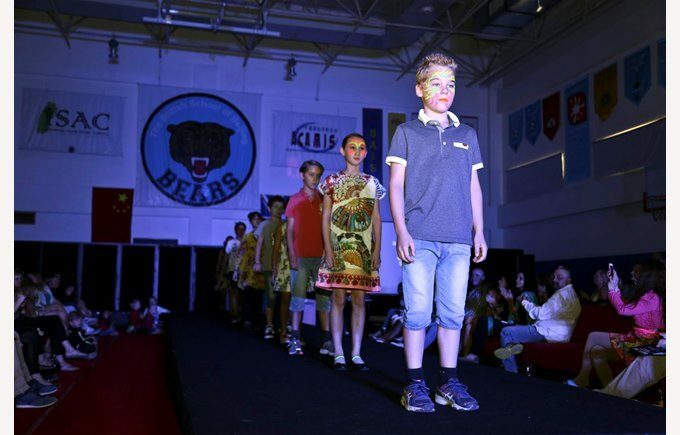 Students also hosted a BSB Fashion Show in April 2015 and hope to make this an annual event. While the student designers are year 12 and 13 students, the models cat-walking their way down the runway will be anywhere between the ages of eight to 13 (kids wear) and 16 to 18 (adult wear). The theme of last year’s fashion show. Those that can’t make it to see the show, or frequently leave their wallet in their other pants pocket, might still be able to purchase the students’ pieces online after the show. Maizie explained that attendees who are interested can find out more about purchasing pieces after the event by speaking to the organizers. No matter what you walk away with, whether it be a bellyful of food, an armful of clothes, or a bit more knowledge about the educational situation of children in Tanzania (or all three! ), it’s sure to be a night full of stunners and forward-thinking looks. More information can be found in the events listing here. Tickets can be purchased here.